The villa is beautiful and perfectly maintained. Astonishing view, especially at the sunset, and of the coast and the sea. Beautiful and perfectly clean swimmingpool and every confort you may need. The owner is very nice and the house is just perfect! Wonderful villa. Very comfortable and well equipped like home from home. Beautiful pool and gardens. All very clean. Host friendly, attentive and very helpful. We came in and we were speechless, an attractive house which immediately feels like at home. Completely private located and quietly. From the swimming pool super sea views, sunset, and the twinkling boat lights at night. The kitchen is fully equipped and all kitchen amenities you can think of are provided, so for cooking lovers it’s heaven. The House was very clean on arrival and everything was fresh. The owner of this House is welcoming, helpful and tells you all the attractions of the island. We will certainly go again because it was hard saying goodbye to the house after 1 week. Julie, thank you once again that we could call our holiday a perfect holiday thanks to your beautiful villa! Hope to see you again soon! This comfortable villa is the perfect place to have a relaxing holiday, it’s clean, well maintained, and has all facilities that you can wish for. The pool has a great view over the ocean, there is a well equipped kitchen, a barbecue and even a wood fired pizza oven. Julie was very welcoming and provided us with great suggestions to places to visit over the island. Een mooie villa die van alle gemakken is voorzien zodat je een lekker ontspannen vakantie kan hebben. Door de ligging op een heuvel heb je vanuit het zwembad een prachtig uitzicht op de zee, zeker met zonsondergang. Het huis is nieuw, dus alles ziet er netjes uit en het is van alle gemakken voorzien. Vooral de barbecue en de pizza oven op het terras waren een succes! Staying in Ecovilla Melivaro was one of the best travel experiences I have ever had. Located above a charming little village with a breathtaking sunset view, we loved the villa’s rustic & traditional feel, which made it easy for us to unwind right from the moment we arrived. As a group of five travelling for the summer holiday, we loved spending time on the outdoor terrace, the perfect gathering spot, and by the infinity pool of course. We were also impressed by the interior decorations and the top notch amenities – it’s easy to see that a lot of heart and thought were put into this place by Julie and her family. Julie was also the best host we could have hoped for! She made sure we had everything we might need and was more than welcoming and helpful throughout our stay, by giving us great tips and recommendations. We will definitely come back! Our family arrived from San Francisco and Perth to meet up at this lovely villa. We couldn’t have been happier with our choice. 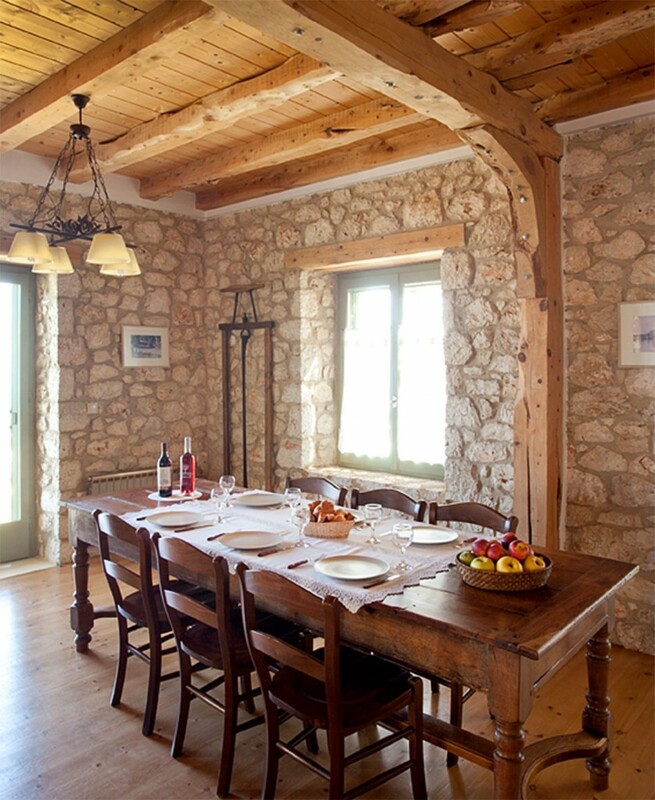 The villa is attractively furnished and decorated, spacious, and comfortable. The children ages 5 and 3 loved playing with the closet full of toys. 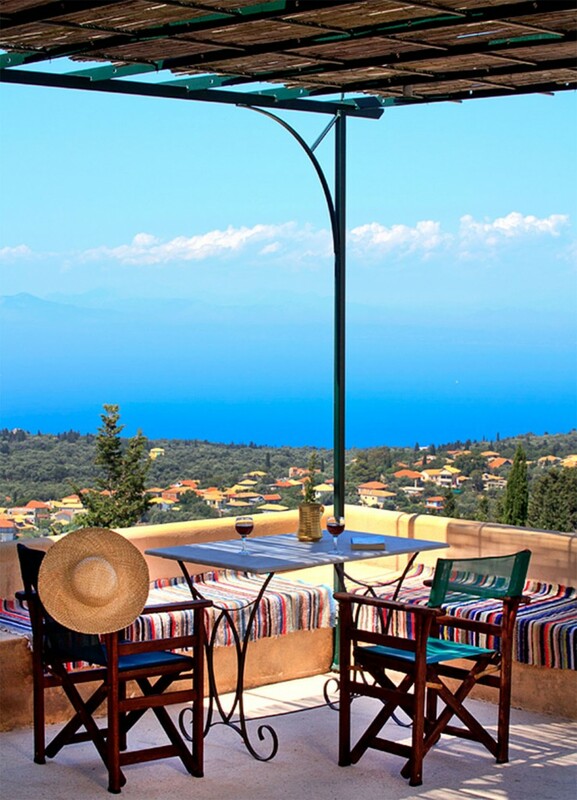 The location is ideal, close to town for evenings strolls in the old town, yet located higher up in the small village of Tsoukalades with its cool afternoon breezes. Tsoukalades has a great mini market with fresh fruit and vegetables and we did all our shopping there. The nearby family operated Taverna, Kampos, is a must to visit for dining in and takeout. In the parking lot for the Taverna goats and chickens greet you and set the tone for a delicious home cooked meal. Instead of the more popular beaches on the maps we preferred the local beach in Tsoukalades without the crowds or parking problems. The owner is exceedingly helpful and went of her way to make sure we were enjoying our stay. We had guests over one night for dinner and had fun cooking pizza in the outdoor wood fired oven. I highly recommend this place..
We stayed two families (total 10 persons) in the beginning of July.We totally fell in love with the house. It was fantastic in many ways. It was the perfect house in the country; large, rustic, cool and naturally ventilated open to the ridge & lots of windows, many “hang out spots” in and around the house, decorated and furnished perfectly, nothing was missing. Felt like we found “our” country residence. The house is even better than the pictures.Superb customer service. It was our second stay at melivaro and it already felt like homecoming. A wonderful place with a great view from the top of a hill all over the island. The house is beautiful with all luxury and a lot of space you need to have a relaxing and great time. At the beginning of the stay you will be greeted by the owner and get a lot of information about the island and suggestions for things to do. We’ll certainly want to visit melivaro again! We spent two weeks in α fantastic scenery with a view on sky and sea, undisturbed by anything. Melivaro is a house that leaves nothing you could wish for. Ecologically build but still so luxurious with enough room for everyone. It is an individual, special house on an individual, special island. It couldn’t be better. Many thanks to Julie and her team of helpers who were very welcoming and provided good and kind service. It has been a pleasure to come back to melivaro this summer. We enjoyed our stay in Lefkada very much (despite the heat and the occasional rainshower !). One highlight of our stay was the dolphins cruise in Amvrakikos. You really have to do this once ! Absolutely beautiful villa situated in a gorgeous mountainside setting amazing views. The villa was well equipped with everything you need and Julie was more than helpful and accommodating, giving us great suggestions for what to do in Lefkada and even helping us book a sailing trip. 100% COMFORT. We were three children, 9, 13 and 17 and 4 adults. The house is very comfortable. There is everything necessary for very, very good holiday. The rooms are very quiet and with wonderful views. We loved the house. Pool has a nice view. The garden is wonderful. There are nice restaurants and beaches. Owner – Julie – is very cute. A pleasure, will come again ! It was very, very nice to stay at your beautiful house, thank you very much for your hospitality, especially for helping us with the ear-problem ! Thank you again, hope we see us again. 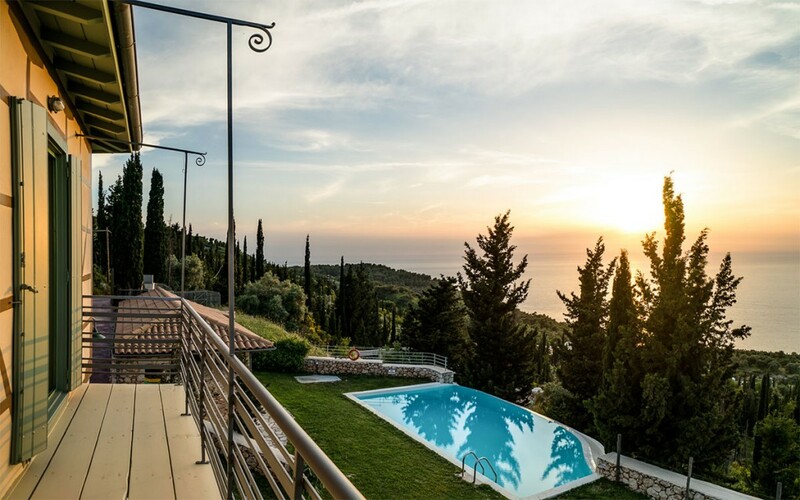 Melivaro is a superb vacation villa; secluded with a panoramic view of the sea, the mainland mountains and the distant islands but also only a short 10 minute drive to the restaurants and amenities of Lefkada town. In the other direction, heading south along the west coast you quickly encounter one spectacular beach after another. Or follow the road up the hill from the villa to the mountain villages and fertile valleys of the interior. 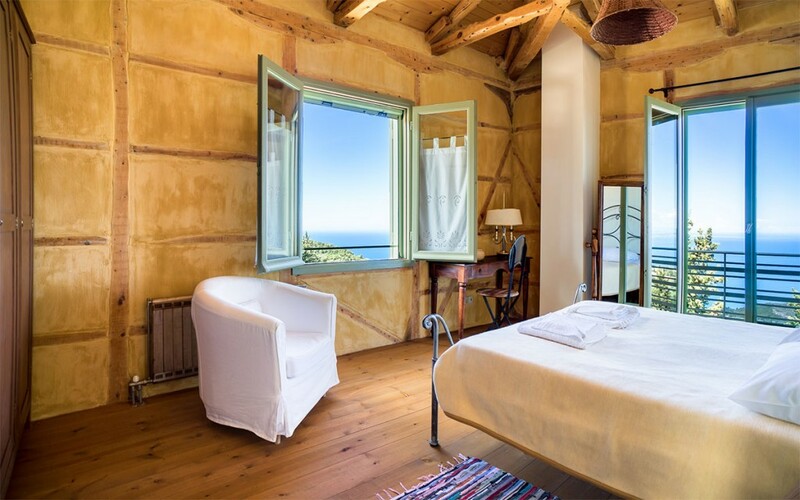 And the villa itself, beautifully and solidly constructed from local stone, cypress and olive wood, adds its own deep charm to the experience. You can also expect outstanding hospitality and personal attention from Julie, Melivaro’s owner. 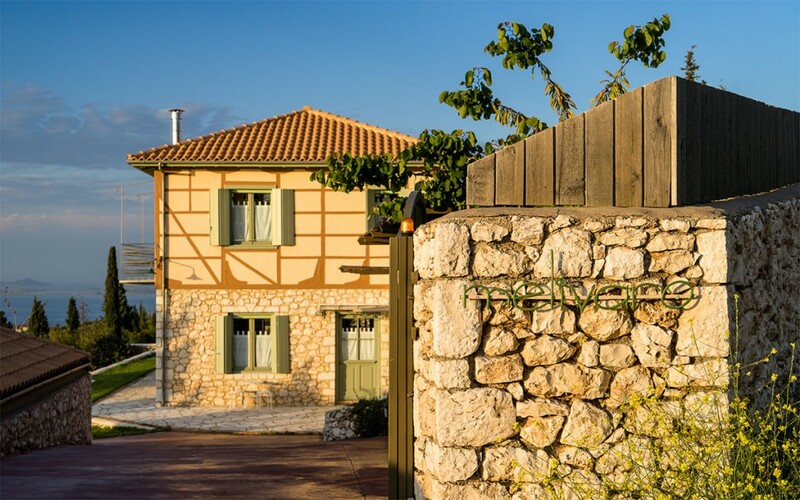 If you are looking for beauty, tranquility, and quiet enchantment, and the opportunity to experience the essence of Lefkada, Melivaro is the perfect spot. Hvala za jos jedno predivno letovanje. Melivaro kuca je dodatno ulepsala nase iskustvo na suncanoj Lefkadi. Udobnost, konfor, okruzenje i pogled na more su neprocenjivi. Moja porodica je uzivala i sa zadovoljstvom mogu da preporucim vasu kucu kao najbolje mesto za boravak na ostrvu. Zelim vam da uvek imate puno gostiju iz Srbije koji bi mogli da imaju istovetno iskustvo. We had the most wonderful time here at Julie’s home and on the Island. We returned a 2nd year in a row. We are a large group, 2 families and 5 kids and the house NEVER felt crowded. Julie is a wonderful host and was always available for questions, suggestions and information that helped to increase our time. This is the first house I have ever rented that is even more wonderful than the pictures promise. The only thing we lacked on our vacation was more time! Don’t hesitate, rent this home. We really enjoyed our stay at Melivaro very much! The view is amazing. The climate is perfect an the house offers everything you need for a relaxing family holiday. The little details around house and garden makes it a very special place and we immediately felt at home. Not to forget your useful recommendations! We have all loved melivaro villa with its homely comforts, cooling infinity pool with spectacular views, amazing outside cooking area and the peacefulness ! We have all relaxed here and are very sad to leave already. We’ve had some dramas with the electrifying storm taking out all the power and frightening the children but it all adds to holiday tales to to be told back home! We thank you so much for your kind hospitality and attention to detail, we will of course recommend melivaro and certainly hope to return ourselves and look forward to candlelit suppers on the terrace, watching spectacular sunsets ! Thank you for everything. Your home was beyond what was expected. We loved our time here and now have a lifetime of memories. We will return! 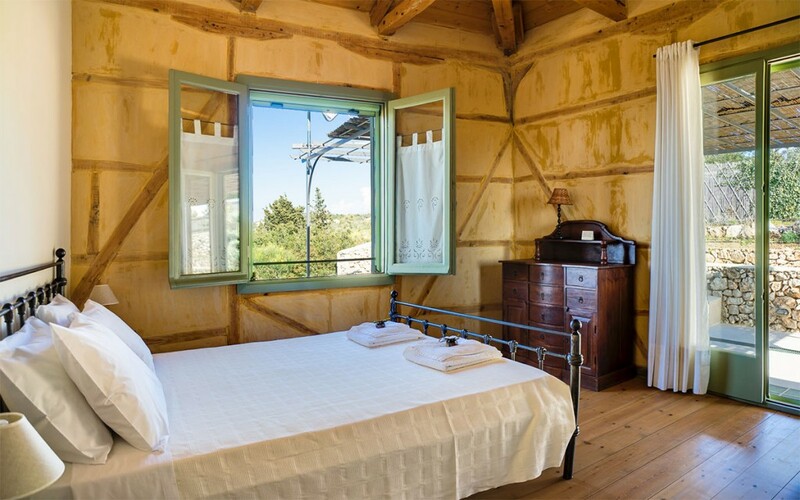 If you want a good healthy rest, choose “melivaro” house in Lefkada. This house is made with great care, ecological consciousness, for people who want to rest in the house. Elegant and very practical interior and outdoor decoration. I like especially how the kitchen is organised, easy for any kind of cooking, vegetarian, macrobiotic or other. I also was pleasantly surprised by the possibility of having an ayurvedic massage at the house, and Mr Yiannis Kapaios is a real master. Ako želite kvalitetan odmor u grčkoj izaberite “Melivaro House” u Lefkadi. Gradena sa velikom paznjom, ekološkom svešću za one koji ce se odmarati u njoj. Uz dobro organizovan prostor za spavanje, posebno me je oduševila kuhinja, opremljena za bilo koju vrstu kuvanja; makrobiotičko, vegetarijansko itd. Noci su prijatno sveže jer je kuća na nadmorskoj visini od 375m. Posebno iznenadenje je bila mogucnost da se pozove master, specijalista u “ajurvedskoj” masaži. Gospodin Yiannis Kapaios je pravi “master”. J’ai apprécié la classe, le charme, le confort de la maison, l’authenticité et les eaux merveilleuses de Lefkada. La mer Ionienne il domine. We hebben een geweldige tijd gehad in het prachtige huis boven op de berg. Het huis is voorzien van alle gemakken, heeft een prachtig uitzicht en heel veel privacy, we hopen zeker terug te komen! We had a great time in a lovely house on top of a mountain, with a wonderful view. The house has everything and a lot of privacy. We hope to come back here! Lorsque Julie nous a très chaleureusement accueillis dans sa belle maison de campagne avec un intérieur tout en bois, nous nous sommes tout de suite sentis très à l’aise. Etant perchée en haut d’une colline, nous avons pu profiter du haut de notre chambre, de la terrasse ou de la piscine, de la vue imprenable sur la mer et la côte, et bien sur apprécier les couchers de soleil. L’ile de Lefkada étant petite, tout est à proximité, parfait pour pouvoir profiter de tout sans faire trop d’efforts. De vraies vacances inoubliables, merci Julie! Wow! Pure peace and serenity with beautiful views. The house is amazing, all the amenities you require, and with Julie as your wonderful host, you are sure to enjoy your stay in this magnificent house. Melivaro is stunning in every way. It is homely and well equipped and in the most beautiful location. Julie’s attention to detail made our stay truly perfect and we found it very hard to leave! We will be recommending it to our friends and would love to return again one day. We felt very well in your house. Everything was perfect : the location, the architecture, and your smile! It is a great location for relaxing after a day of travelling, or at the beach, or for having a barbecue with your friends and staying in a friendly atmosphere. It is also great as a place to get to know the island. We are very happy that we found your website! Once again thank you very much for everything! It was our fortune that melivaro wasn’t booked for this particular week, so we had the chance to stay at this overwhelming place with its unique charisma. We all enjoyed it! Auf den bunten Liegestuhlen von melivaro die Meerfarben annehmen. Gluck – der Wunsch nach Wiederholung! Dès le début, c’est à dire lors des formalités pour réserver la maison, nous avons eu un très bon “feeling” avec les propriétaires. Puis le jour de notre arrivée nous avons particulièrement apprécié que la propriétaire nous propose d’effectuer une rotation avec voiture pour monter de Lefkada à melivaro quelques membres de notre “tribu” (10 personnes) et une partie de nos bagages. Et l’arrivée a melivaro nous a bel et bien “bluffé” : le charme de la maison, le site superbe et la vue à couper le souffle. La propriétaire qui a passé un long moment pour nous faire visiter la maison, les installations (piscine,.) 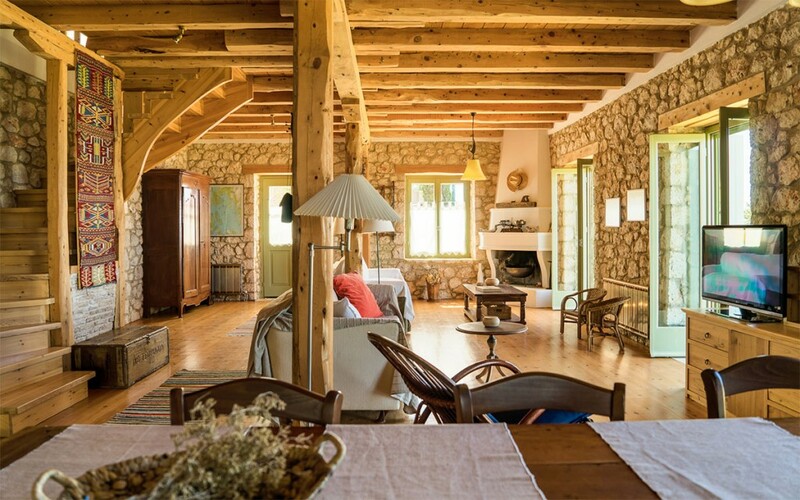 et nous donner toutes informations utiles sur le fonctionnement de la maison, nous a également fourni de nombreux renseignements sur l’Ile de Lefkas, afin de rendre notre séjour agréable. L’emplacement de melivaro à 8 km de Lefkas est un atout indéniable. Les tavernes du village proche de Tsoukalades sont très agréables, et le libre-service est bien approvisionné. Il ne manque rien dans la maison, équipée parfaitement et décorée avec beaucoup de goût. Nous avons apprécié les nombreuses petites attentions des propriétaires pour accueillir les locataires : bouteilles de vin typique, etc. et la documentation touristique très complète. En bref, melivaro est un merveilleux endroit pouvant accueillir sans problème deux familles, et permettant d’alterner le farniente autour de la piscine à débordement, avec les excursions sur l’ile. Encore merci à Julie pour son accueil. Second straight year in Lefkada. and second straight year in melivaro! The house is like we remembered, maybe even better: a beautiful traditional Greek house with a large garden and a pool. Julie, the lovely owner, has made some small improvements, which have helped us to enjoy our stay even more. The location is fantastic, on a top of a green hill, and the evening temperature is cool, even in this hot summer. Lefkada is a wonderful island, with white sandy beaches and green small islets around. Melivaro is the “cherry on the cake (at least we say so in Italy) which has made our summer holiday unforgettable! We had a great experience in Lefkada-melivaro! Thank you for having us in your wonderful house which gives us a wonderful view of the island! We look forward for coming back! With friendship, best wishes from Roumania! Amel, Mihai, Maria, Aly, Elenush, Catalin, Dany, Petre, George, Elena, Bogdan! Unser Urlaub in Melivaro war einfach herrlich und wir konnen es nur warmstens weiterempfehlen! Mit 2 Familien (5 Kinder!) haben wir die Grosszugigkeit des Hauses, die herrlichen Sitzplatze draussen, den Garten und das Pool wirklich genossen. Dazu die super ausgestattete Kuche mit Julies Gemuse hinter dem Haus – nichts was wir uns anders gewunscht hatten! Auch die Lage fanden wir perfekt – herrliche Aussicht, der kleine Ort Tsoukalades mit der netten Backerei, dem hervorragenden Fischlokal (fangfrisch!) und dem kleinen Supermarkt, trotzdem nicht weit nach Lefkada und zu den wunderbaren Stranden. Besonders nett waren Julies? Tipps, so haben wir das Gefuhl Lefkas wirklich kennengelernt zu haben! Eine ganz besondere Insel und ein perfektes, wunderschones Haus – wir wollen alle Neun nochmal kommen! Our holiday in Melivaro was simply marvellous and we highly recommend it to everyone. As two families including 5 children, we really enjoyed the spaciousness of the house, the great garden with lots of different sitting areas and of course the pool with the wonderful view. With a very well appointed kitchen and Julie’s vegetable garden behind the house, we certainly didn’t want for anything! The area in which the house is situated doesn’t just offer beautiful views but is also not far from some lovely beaches and the main town of Lefkada. Just down the road is the small village of Tsoukalades with its nice bakery café, an excellent fish restaurant serving freshly caught fish daily and a small supermarket. Julie’s tips were particularly good and as a result we really had the feeling of getting to know Lefkas, a very special island and a wonderful house. All nine of us want to visit again! Melivaro villa is truly magnificent. It was beyond what we expected. This villa has everything you might need to make your stay very special. Very tastefully furnished, comfortable villa with lots of extras. We had small children and babies as well as teenagers, and the villa offered something for everyone. The views from every room and the patio were breathtaking. The pool and gardens were excellent and we spent many happy hours just being at home. The Melivaro is in a great location, far enough away from town to be utterly peaceful but close enough to enjoy all that Lefkada has to offer. Julie spoke very good English and was extremely helpful. She gave us many details about the villa and area that we were in. Anything we needed was taken care of. All in all, we had a lovely holiday. Highly recommended as the perfect holiday home for family with children. In casa melivaro si respira un’aria familiare, e come stare a casa propria. Julie e una persona stupenda e una grande amica, melivaro e fantastica. Tutto e stato perfetto. Grazie !!! “Ένα πανέμορφο σπίτι, το κάνεις αμέσως δικό σου, ζεστό, λειτουργικό, ένα στολίδι μέσα στην όμορφη φύση της Λευκάδας. Για τον εξωτερικό χώρο τα λόγια είναι λίγα να περιγράψουν αυτή την απέραντη θέα. 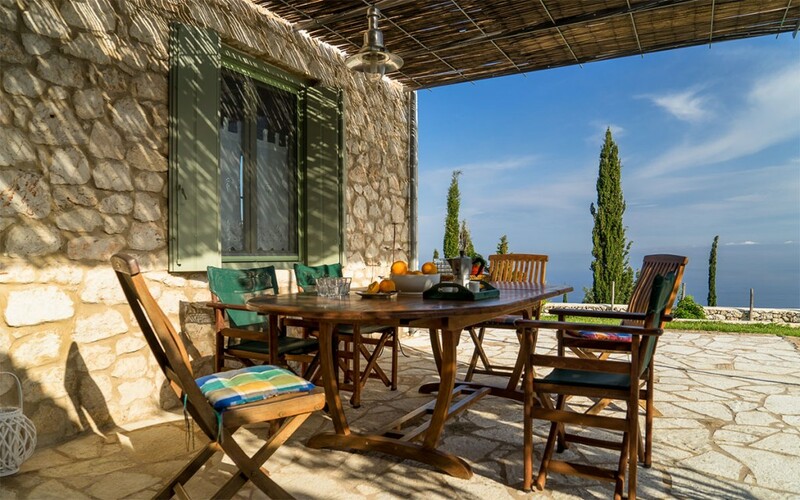 Séjour de rêve chez Julie, une maison d’hôte située dans la montagne à moins de 10 km de Lefkas. Sa charmante propriétaire, une Française aux ascendances angevines, nous y accompagne avec nos bagages. Maison traditionnelle construite aux standards antisismiques de la région (fondations en pierres, façades des étages alliant charpentes en bois et torchis), elle se distingue aussi par ses caractéristiques écologiques : électricité et chauffe-eau solaires, jardin potager où s’épanouissent de belles aubergines et courgettes… dont les “hôtes” peuvent se régaler. 3 des 4 chambres disposent d’une vue sur la mer, avec orientation ouest/nord-ouest, appreciée des amateurs de soleil couchant… qui peuvent d’ailleurs l’admirer aussi en se rafraichissant dans la piscine à l’eau turquoise, sise à flanc de coteau. Club-house discret, coin barbecue… et aussi petite terrasse orientée est pour les lève-tôt ou les poêtes inspirés par le Levant et qui veulent taquiner la Muse en portant leur regard sur la mer Ionienne. La maison de Julie a un nom : Melivaro. On s’y trouve tellement bien qu’on pourrait même se passer de l’incontournable visite de l’ile et de ses plages étonnantes au pied des falaises blanches, d’où Leucade tire son nom. Simply perfect. Perfect house, host, facilities, pool and gardens. It is the sort of house you come back to and wished it was yours and that you lived here ! The children aged 12,10,7 and 5 described the house as “awesome”. We are really sorry to be leaving! The house is in a great location. Aghios Nikitas (10 minutes away) is very pretty and has great tavernas. Good beach for snorkelling as well. Supermarket in village very good with all the basics. Lefkas town (also 10 minutes away) has some lovely shops and bars, and good food shops. Waterfront and marina has a great feel about it. Kids favourite beach : Kalamitsi, beautiful blue clear sea and lovely sand. Day trip to Meganissi really good fun. We’ve been coming to Lefkada for over 10 years now and Melivaro is by far the best place we have stayed. The view is breathtaking. The house, grounds and pool are very spacious and impeccable. Plenty of room for 2 families. We used to book houses by the beach but, now that we’ve tried Tsoukalades, the cool fresh air and utter calm of Melivaro makes the very short drive to the beach worthwhile. I’d recommend it to anyone. We’ll be back! “Η Λευκάδα είναι πολύ όμορφο νησί με τα καλύτερα χρώματα θάλασσας. Το σπίτι είναι εντυπωσιακό, με όλες τις ανέσεις ώστε να κάνει την διαμονή μια ευχάριστη ανάπαυλα. Το σπίτι ήταν φανταστικό ! Η διαμονή ήταν παρά πολύ άνετη και όμορφη. Το σπίτι έχει όλες τις ανέσεις και ήταν όλα πολύ ωραία. Η Λευκάδα είναι πολύ ωραία με πολλές φυσικές ομορφιές! Η διαμονή ήταν άνετη και ευχάριστη, και έτσι γεμίσαμε τις μπαταρίες μας. Θα σας ξαναέρθουμε τα επόμενα χρόνια. Ας έχουμε όλοι ένα όμορφο χειμώνα! Ευχαριστώ για τις όμορφες διακοπές! Το σπίτι είναι καταπληκτικό, οι χώροι του είναι απίστευτα καλοί και λειτουργικοί ! Η Θεά απερίγραπτη ! Το βιοκλιματικο σύστημα λειτουργίας του σπιτιού δεν διαφέρει σε τίποτα από τα συμβατικά, και σε βάζει στο οικολογικό πνεύμα με τον καλύτερο τρόπο! Το τέλειο μέρος διαμονών! Για οικογένεια, όλα είναι πολύ βολικά και άνετα. Περάσαμε καταπληκτικά και όλοι λέμε πως θα θέλαμε να ξαναέρθουμε! Για όλους μας πλέον, Λευκάδα = Μελιβαρο !!! Many many thanks for a great week!